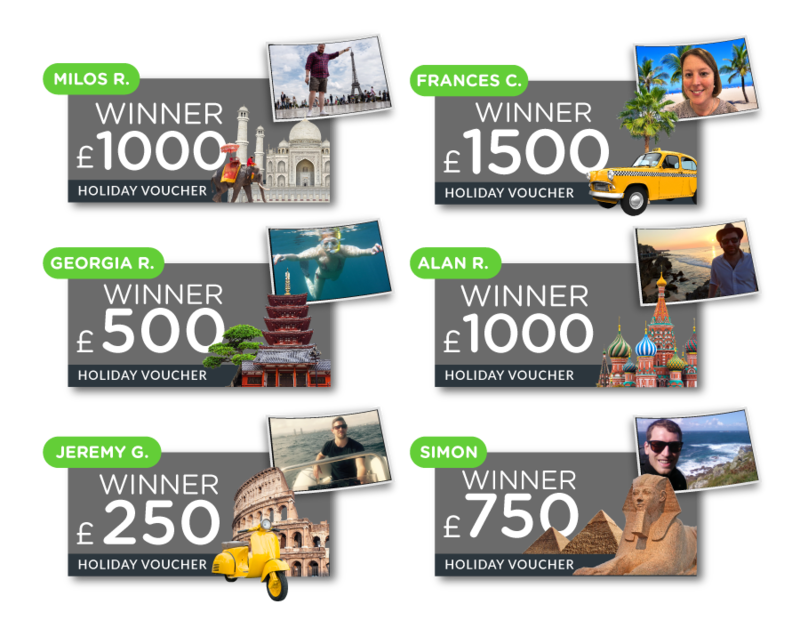 £5K's worth of holidaying up for grabs. All you've gotta do is give us your laundry! You do the escaping, we do the laundry. We’re giving you six chances to help make your dream holiday a reality with one Laundrapp order! Jet off to any city, sea resort or scenic destination of your choice. But the earlier you order, the greater your chances of winning. Simply download the award-winning app – available on both iOS and Android – schedule your laundry and dry cleaning pick-up using code GETAWAY at checkout, and you’ll be entered into our daily prize draws. Six prizes, six days – one giveaway every day. ? The odds are in your hands! Ordering early qualifies you for all the remaining daily giveaways! The earlier you order, the more prize draws you’ll be entered into! Congrats to our winners, Milos, Georgia, Jeremy, Frances, Alan and Simon! Competition ends Sunday. So ordering on launch day (Tuesday) enters you into six giveaways, giving you the best odds! A Wednesday order enters you into five, Thursday for four, and so on, all the way up to Sunday. Winners will be updated on this page daily. ? 1. Code ‘GETAWAY’ must be applied at checkout for competition entry. 2. No other code can be used in conjunction with this competition. 3. Orders must be placed before 11:59pm every night in order to qualify for that day’s prize draw. 4. The competition ends 11.59pm on Sunday. 5. All entries submitted via email will be checked by the time our servers received them (Our servers are set to Greenwich Mean Time). 6. The prize draw is open to all [Laundrapp account holders] who are UK residents (excluding Northern Ireland) and aged 18 years or over. Duplicate entries will not be considered. 7. Laundrapp accepts no responsibility for entries not successfully completed due to a technical fault. 8. Winners will be chosen by random draw performed by a computer process. 9. Winners will be notified by telephone or email (using the details provided) by latest 3:30pm on the day they’ve been drawn for the daily prize. 10. Winners must respond to claim their prize by 11.59pm on the day they’ve been drawn. In the instance they’re unable to claim their prize by this time, another draw will be held to find another winner. 11. Winners are required to participate in publicity related to the prize draw, which may include the publication of their name and photograph in any media. 12. The decision of Laundrapp regarding any aspect of the prize draw is final and binding and no correspondence will be entered into about it. 13. Participants are deemed to have accepted and agreed to be bound by these terms and conditions upon entry. 14. Winner may be required to participate in publicity related to the prize draw, which may include the publication of their name and photograph in any media. 15. Personal data supplied during the course of this promotion will be used only for the purposes of carrying out the prize draw and delivering the prize to the winner. 16. The Prize draw will be governed by English law and entrants to the prize draw submit to the jurisdiction of the English courts. 17. This prize draw is run by Laundrapp Limited, a company registered in England and Wales under company number 08971706 of Laundrapp Shop, (“Laundrapp”).